"Personalized Triple Ring Silver, Adoption Jewelry"
Our triple band adoption ring helps you commemorate one of the most important days of your life ~ the day your family added more love. Nelle and Lizzy will help you celebrate your adoption by creating a custom adoption ring by hand-stamping a word, a bible verse, a phrase, or any other symbolic statement of your faith to create your own piece of meaningful jewelry. Stamp up to 12 characters or spaces per band. 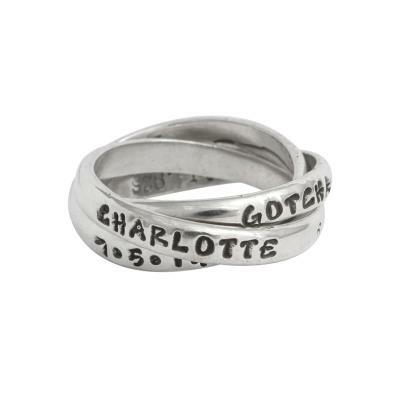 Our adoption ring commemorates one of the most important days of your life ~ the day your family added more love. Nelle and Lizzy will help you celebrate your adoption by creating a custom adoption ring by hand-stamping a word, a bible verse, a phrase, or any other symbolic statement of your faith to create your own piece of meaningful jewelry. Be creative - you can put one word on each band or put a whole phrase using the three bands stamped with part of the phrase.